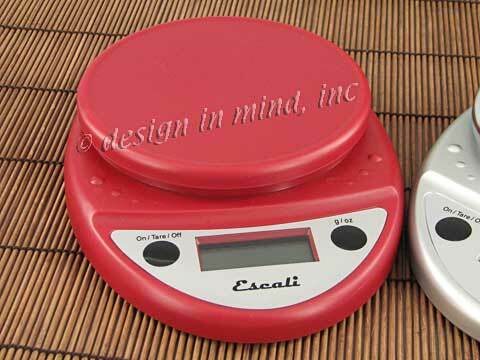 Choose an electronic scale for precise measuring or your favorite style of scoop. When trying out new teas, Devotea recommends using a precise scale for measuring tea. Start with 2 grams of tea per 8 ounces of water. then adjust up or down to suit your taste. Once you learn how many scoops are needed to get the right weight for a particular tea, you can skip the scale. Bright stainless steel tea scoop. Perfect for scooping loose tea into your teapot. 3 inches long. 1.5 inches wide. One rounded scoop is about 1 tablespoon. Heavy 18/10 stainless. Made in China. 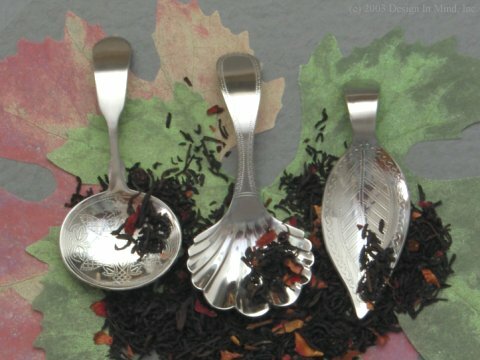 Bright stainless steel tea scoops. These can be used for scooping loose tea into a pot, or as a "tidy" to hold a teabag after use. Made in China from heavy 18/10 stainless steel. Oval (left) has engraved design (pattern varies) on the bowl and is 4 inches long. Shell (center) has engraved design on the handle and is 4 inches long. Leaf (right) has engraved design on the bowl and is 3.5 inches long. 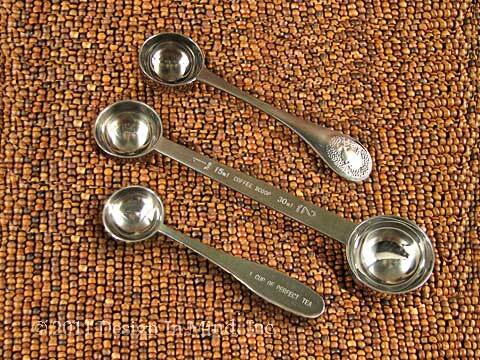 Bright stainless steel measuring spoons for tea and coffee. From the top down. The "Perfect Pot of Tea" scoop holds 1 tablespoon, enough for a 3 cup pot. 5 inches long. Double ended coffee scoop, holds 1 and 2 tablespoons. 7 3/4 inches long. 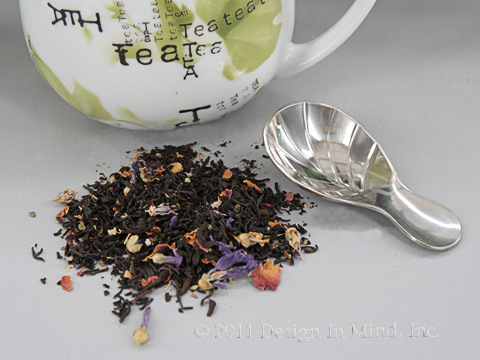 The "Perfect Cup of Tea" scoop holds one teaspoon, just right for one cup. 4 inches long. How do I measure tea for best results? How do I check my order online?